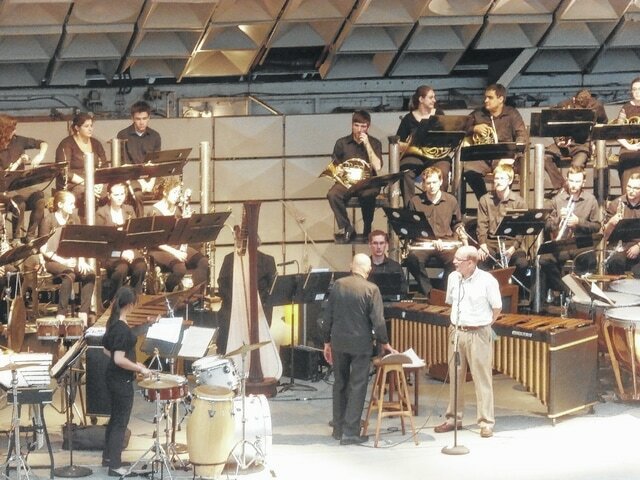 Maestro Robert Austin Boudreau shares the stage with Jack Fowler of the Point Pleasant River Museum and Learning Center. Fowler had the idea to bring the American Wind Symphony Orchestra to Point Pleasant. The 40-piece orchestra was comprised of musicians from all around the world. Some will return to Point Pleasant in the fall as part of the “Winds Over West Virginia” program for band students. The American Wind Symphony Orchestra performed original pieces written for the orchestra as well as favorites like “Up A Lazy River.” In addition, Mayor Brian Billings, pictured onstage, recited a monologue originally performed by Hal Holbrook as Mark Twain. POINT PLEASANT — The rain may have dampened the numbers a bit, but a determined audience came out Saturday to hear something new, unique and free at Riverfront Park. The American Wind Symphony Orchestra’s performance did not disappoint those who turned out, proving if you offer it, people will come see it — and there are those who want to see something different. The 40-piece orchestra led by Maestro Robert Austin Boudreau performed original pieces written for the orchestra as well as favorites like “Up a Lazy River.” In addition, Mayor Brian Billings recited a monologue originally performed by Hal Holbrook as Mark Twain. Twain is forever tied to river life and Mason County as his grandparents, Samuel and Pamela Clemens, lived north of Point Pleasant in the early 1800s. That property later became Clements State Tree Nursery. At one point, Maestro Boudreau asked Jack Fowler to join him onstage. Fowler was instrumental in bringing the orchestra to Point Pleasant. Fowler acknowledged his appreciation for the financial support of the Jackson Foundation and Claflin Foundation, which funded a large portion of the price tag to stage the event. Back in March, Fowler told Point Pleasant City Council the concert would cost around $45,000, but promised it would not cost the city a dime and he delivered on that promise. The Point Pleasant River Museum and Learning Center, along with the City of Point Pleasant, sponsored and hosted the event. Fowler also told those in the crowd he had met the musicians and they were a “fine group of young people.” Some of these musicians will be returning tis fall to Point Pleasant and other communities in West Virginia as part of “Winds Over West Virginia.” This program will allow the musicians to work with students in local band programs by teaching fundamentals of orchestral instruments. Point Pleasant was the second stop on the orchestra’s tour as it makes it way along local waterways on its floating home the Point Counterpoint II. Shows are set for Ravenswood, St. Albans, Princeton, Marietta and East Liverpool, Ohio, among others. The first show was in Huntington last week. As Maestro Boudreau pointed out during the concert, there are all kinds of music, not everything is “Up a Lazy River” but it’s all music and it’s important to study and examine the notes. What’s the point of playing, or hearing, the same old songs, he asked?